When Cara first asked if I’d like to share my writing space with you all, I made a weird gulping sound. 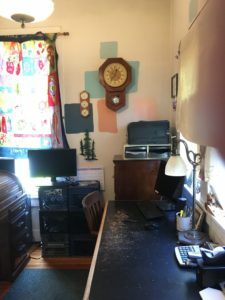 What I wanted to share was my neat and clean dream office, complete with walnut floor-to-ceiling bookcases, a sunny window seat, and frothy curtains. Heh. You know that’s not what you’re getting today, right? In reality, I’m a migratory writer. 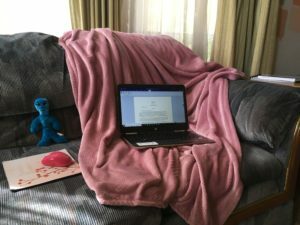 There are three main spaces around our house where I write, and I often occupy all of them at least once during the course of a day. First, I share an office off the kitchen with my accountant husband. (That’s code for: he’s neat and organized, and I’m…not.) This is where most of the writing of my first book occurred before I got my laptop. The windows to the right look out toward the playground where my kids went to elementary school. I’d take breaks to watch them when they were out there. Eventually, the office will move into one of the upstairs bedrooms, and this will be converted into a breakfast nook. With real curtains. Possibly even “frothy” real curtains. Note the patchwork paint squares on the wall—we don’t like any of them, can you believe it? The milk crates are temporary until the new computer is finally set up. Behind them you can sort of see my writing calendar. My favorite space these days is on the couch in our living room. (Yes, those are more paint squares on the wall. We like to think through our decisions very carefully.) We live in a Victorian and it can get cold during the day when the heat’s off, so I have my trusty pink fleece blanket to keep me warm and cozy. If you look close you’ll see a little blue alien my pal Rosalie Redd sent me when she visited Area 51 last year. Good thing he can’t talk, because he knows an unbelievable number of secrets about my books. Thanks for hanging out and taking this little tour of my favorite writing spaces with me! 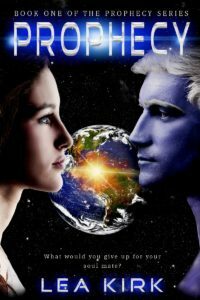 USA Today Bestselling Author, Lea Kirk loves to transport her readers to other worlds with her sci-fi romances. 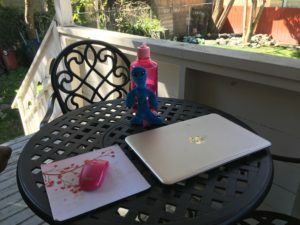 When she not busy writing about the blue and green aliens of her Prophecy series, she’s hanging out with her hubby, five kids (the nerd herd), and spoiled Dobie mix—who tried to eat the secret-keeping little blue alien while Ms. Kirk took these pictures. One normal day turns into horror when Earth is attacked. Now ER nurse Alexandra Bock is imprisoned aboard an alien slave ship with no way out. 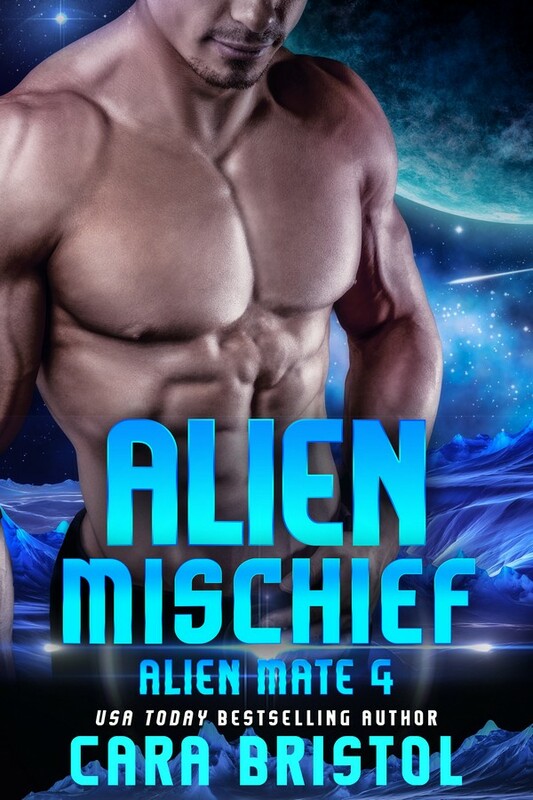 She deems all aliens untrustworthy, including the handsome blue-skinned Matiran captain who shares her cell. One night of treachery leaves Senior Captain Gryf Helyg a prisoner of his enemies. 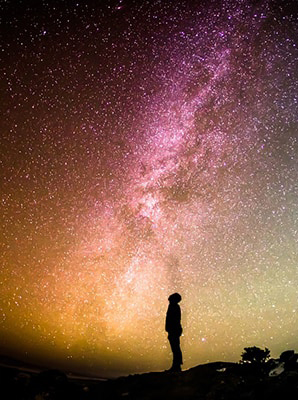 Because of him, Earth’s inhabitants face extinction and his home world is threatened. But his plans for escape are complicated by his inexplicable draw to the Earth woman imprisoned with him. 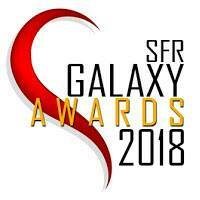 This entry was posted in Authors In Space, Guest blogs and tagged alien romance, author offices, Authors in Space, guest blog, habits of writers, Lea Kirk, Prophecy, romance writing, science fiction romance, where writers write, writer offices. Bookmark the permalink. I love seeing and hearing about each author that is willing to share their creative space. Thanks for giving me a window into your happy place. Thanks for sharing your writing nooks! ((Hugs)) to you, Mary! Thank you. Fun tour, Lea! I especially love that bistro table. Soooo pretty! And the paint splotches just show you’re truly a thinking author. And the little blue man is so perfect. Good choice, Rosalie. LOL! Thanks for giving us a peek into your writing space(s).